Are you aware of your thoughts? Can you consider that your thoughts are not really fleeting and random, they are something more? The other day, Divine shared a wonderful message and vision with me to share with you. She revealed the Garden Of Thoughts. 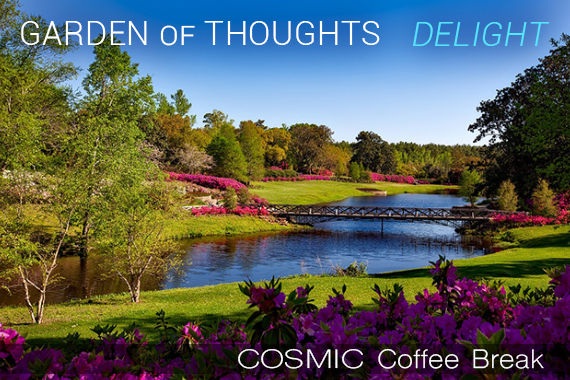 This beautiful garden with large trees, beautiful meandering pathways lined with flowers, and special areas filled with food plants and herbs was the Garden Of Thoughts. Every plant, every living plant was a thought. Join me as we meander and stroll through the Garden Of Thoughts and discover some truly beautiful magic. This episode of the Cosmic Coffee Break has a special meditation to empower and bless your thinking.